To provide the most up to date reference of referral patterns for pelvis and acetabular (PA) fractures in Ireland and discuss where services should ideally be located. A retrospective review was conducted of all referrals to the national referral centre for PA fractures in Ireland for 2016 and 2017. Over the two-year study period 456 referrals were made. Mean age of patients was 53 years, 62.9% were male. Management was conservative in 60.7%, operative in 38.2% while 1.1% died prior to transfer. Nearly half of fractures (47.8%) were due to falls with 38.6% due to road trauma. Referrals from the proposed central trauma network accounted for 76.1% of referrals. Median length of stay was 7 days. Average cost of operative treatment was €11,774. Major trauma continues to be the biggest cause of death in people aged between 5 and 45 years of age. Suboptimal trauma management results in greater ongoing costs to patients, hospitals and society. Trauma networks in the United States, Australia and more recently the United Kingdom have proven successful in significantly reducing morbidity and mortality. In the UK, analysis by the Trauma Audit Research Network (TARN) has shown that a major trauma patient has a 19% increase in the odds of survival following major trauma since its introduction in 20121. No integrated trauma network yet exists in Ireland but a recent report “A Trauma System for Ireland” published in January of 2018 outlined plans of how such a trauma network would be introduced2. The report called for the introduction of two regional trauma networks, a central and south network, with one major trauma centre for each. However, the report made no mention of where the treatment of pelvic and acetabular fractures fell within it. Pelvic and acetabular (PA) fractures account for a small percentage of all fractures (0.4 - 5%) but are often associated with a high morbidity and mortality3-7. They require multidisciplinary specialist care within a trauma system in order to ensure the best outcomes for patients. Traditionally they were most commonly caused by high energy trauma predominantly due to road traffic accidents. However, there is now a growing increase in the number of elderly patients suffering pelvic and acetabular injuries from low energy trauma8-10. This figure is only set to increase as the population ages, with the numbers over the age of 65 in Ireland set to increase by nearly 200% and those over the age of 80 by more than 300% by 204611. The management of these injuries in elderly patients will consume a greater amount of future healthcare resources12. It must also be noted that two thirds of patients who suffer these injuries have associated concomitant trauma3,9,13. In Ireland in 2010 Tallaght University Hospital was designated as the National Centre for pelvic and acetabular fracture management. Over the last 25 years this unit has published multiple studies around the treatment of these complex injuries. At present two specialist consultant Trauma and Orthopaedic surgeons provide management to this cohort of patients in Ireland. As per the British Orthopaedic Association Standards for Trauma (BOAST) and the NICE guidelines these injuries should be managed in Major Trauma Centres (MTCs) or specialist units14,15. The aim of our study was to provide an up to date reference of pelvic and acetabular fractures in Ireland and the operative workload involved so to help guide decisions regarding the provision of these services. A retrospective review was conducted of a prospectively maintained database of all pelvic and acetabular referrals received by our institution (Tallaght University Hospital) from January 1st 2016 to December 31st 2017. Cases involving either a pelvic and/or an acetabular fracture are referred from other hospitals within the Republic of Ireland to our institution where a decision regarding the management of the patient is made. Following discussion with the on call Orthopaedic team a template document is completed by the referring hospital and sent electronically to our institution. This document includes the following details patient demographics, diagnoses, other injuries, background medical and surgical history, medication, allergies, infection status, laboratory results, current status, treatment received to date. This, together with patient images, are reviewed and a treatment plan decided. Cases requiring potential operative intervention are transferred to our institution for further management. Once surgery is completed and the patient is stable the patient is transferred back to the hospital from where they came to receive rehabilitation care. In order to assure the accuracy of the database, the radiology database, theatre logbooks, patient medical records, electronic medical records and HIPE (hospital in patient enquiry) system were cross referenced. 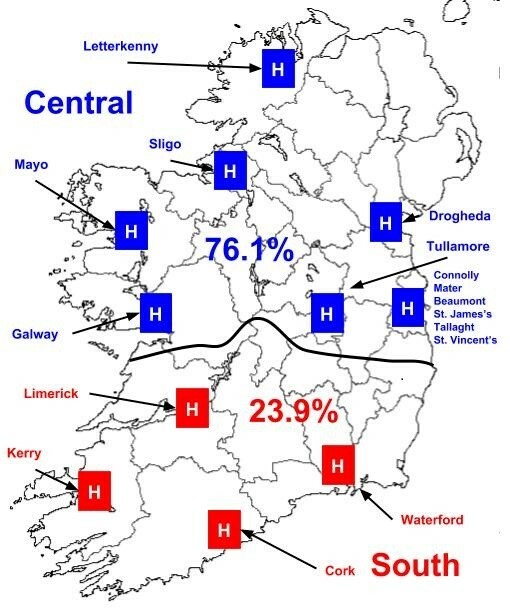 The HIPE system is the national Irish data collection source for all acute public hospitals. It collects demographic, clinical and administrative data creating an electronic record of each patient admission (diagnosis, investigations, procedures, consultations etc.). Using this record, a casemix points score is calculated based on the complexity of the case and a cost or bill is created. A total of 456 pelvic and acetabular referrals were made from 18 hospitals in the Republic of Ireland during the two-year study period. The mean age of patients was 53 years (SD 21.5 years) of which 62.9% were male. Nearly a third of patients (31.8%) were over the age of 65 while 53.5% of patients had one or more co-morbidities (Table 1). Two-hundred and forty-two (53.1%) patients suffered acetabular fractures, 197 patients (43.2%) suffered pelvic fractures and 17 patients (3.7%) suffered both acetabular and pelvic fractures. Nearly half (47.8%) of all referrals were due to falls, with 29.8% due to falls from less than two metres, and 18% caused by falls greater than two metres. Road trauma accounted for 38.6% of referrals and other mechanisms in 13.4% such as horse-riding, crush, farm and atraumatic injuries. One hundred and ninety-seven patients (43.2%) presented with other associated injuries most commonly to the limbs (28.1%) and chest and/or abdomen (16.5%). Nearly two thirds of referrals (65.5%) were from hospitals outside of Dublin, with a third from five hospitals within Dublin. 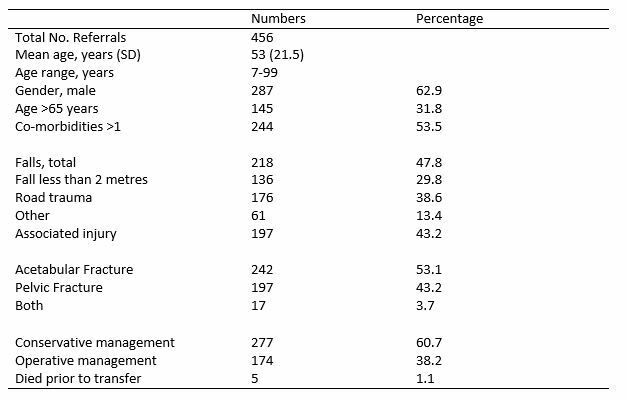 A number of patients (14.9%) initially presented to hospitals with no trauma and orthopaedic services and required transfer to an associated hospital with such services. 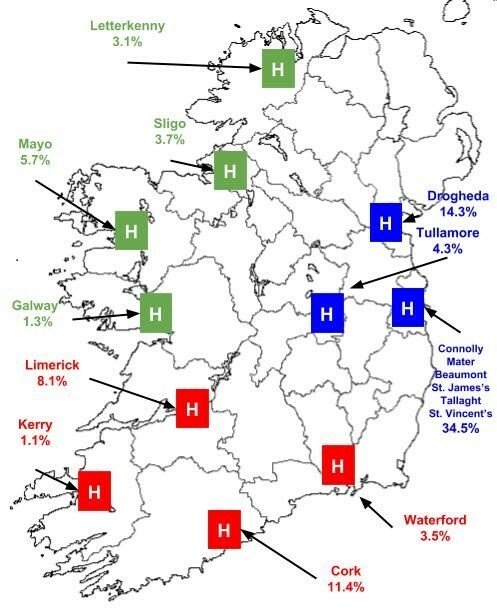 The three main referral hospitals were Our Lady of Lourdes hospital Drogheda (14.3%), Cork University Hospital (11.4 %) and our institution, Tallaght University Hospital, (9.2%) (Fig. 1). As per the proposed trauma system for Ireland, 23.9% of referrals came from the south trauma network and 76.1% from the central trauma network (Fig. 2). Conservative management was chosen in 60.7% of patients (n=277) while 38.2% (n=174) underwent operative intervention. Five patients (1.1%) died prior to transfer. Eleven patients (2.4%) were transferred to our institution but did not undergo surgery. The mean age of patients who underwent conservative management was 57.9 years (SD 22 years), of which 56.7% were male. 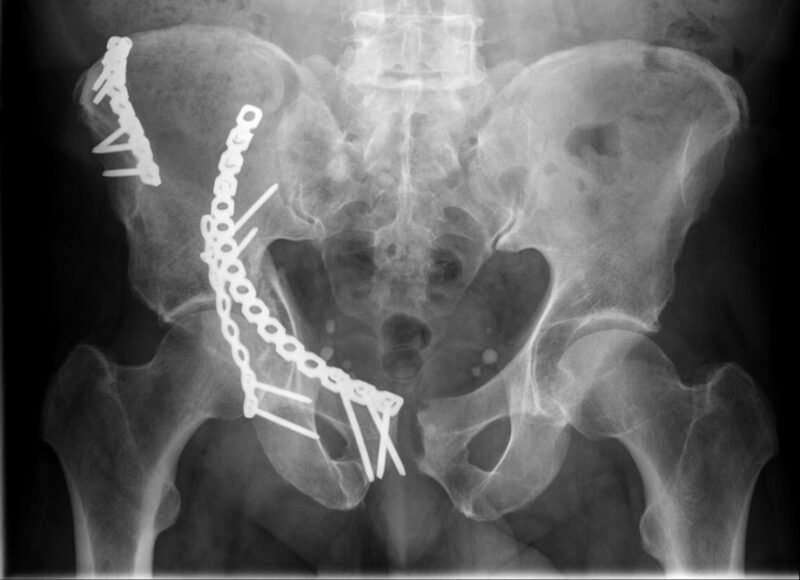 Over the two-year study period 174 patients (38.2%) of patients underwent surgery, giving an incidence of pelvic and acetabular fractures requiring surgery of 1.83 per 100,000 people per annum . The mean age of this cohort of patients was 45.6 years (SD 18.2 years), of which 73% were male. Eighty-seven patients (49.3%) underwent acetabular open reduction internal fixation (ORIF) (Fig. 3), 47 patients underwent Pelvic ORIF, 17 patients (9.7%) underwent evaluation under anaesthesia but did not require fixation and 16 (9.1%) patients required application of a pelvic external fixator for stability. Twenty-five patients required two surgical procedures to stabilise their fracture and 11.1% of patients required additional orthopaedic surgery for other injuries sustained. Eight percent of patients required treatment in the intensive care unit (ICU) and 13.7% of patients underwent insertion of an inferior vena cava (IVC) filter. The median length of stay was 7 days (range 2-36 days). The mean cost of treatment was €11,774 with total cost of treatment for 2016 and 2017 €2,001,644. Major trauma networks improve trauma care16,17. Since MTCs were established in 2012 in the UK it is estimated that over 1,600 people have survived major trauma injuries that would have previously died1. The development of a major trauma network in Victoria Australia was reduced length of stay, the number of care episodes and a greater number of patients being discharged home rather than to inpatient rehabilitation18. In Ireland the “Trauma System for Ireland” report is a step forward in trying to follow these results. The demographic of major trauma is changing. Twenty-five years ago the mean age of patients was 36 years with nearly 60% caused by RTA19. In 2016 in Ireland the mean age of patients was 59 while 51% were due to falls20. However, the mechanism of injury in PA fractures continues to be predominantly caused by RTA in the young (49%) while falls from less than two metres cause nearly two thirds (64.3%) of fractures in the elderly. The mean age of those undergoing surgery has significantly changed over the last 10 years, with patients now a mean age of 46.1 years in comparison to 36.5 years in a study from our institution between 1998 to 200821. The Trauma System for Ireland report launched in January 2018 outlined 45 key recommendations on how Ireland would introduce an inclusive hub and spoke trauma system with two regional trauma networks, a central and south network2. One MTC will be located in Cork (Cork University Hospital) and the other in Dublin, the location of which has yet to be decided. If the referrals from the two-year study period were applied to the proposed regional trauma network system, it would mean nearly three quarters of all referrals would be managed by the central trauma network. Increased funding will be needed to improve the care we deliver to this cohort of patients. Over the two-year study period the cost of providing operative care to this cohort of patients in our institution was €2,001,644. However, this figure does not represent the true cost of caring for this cohort of patients as it excludes all those conservatively managed as well as the cost of rehabilitation in those patients transferred back to their primary hospital following surgery. The introduction of the Major Trauma Audit, in conjunction with the Trauma Audit Research Network (TARN) in the United Kingdom, to all hospitals in Ireland as of 2016 will help inform practice moving forward. Management of elderly patients who suffer major trauma will pose a greater burden on resources in the future. Orthopaedic trauma in the elderly is associated with 30-day mortality that is significantly greater (6.8% vs. 2.5%) then for similar fractures in the young22. In our study those over the age of 65 represented nearly a third of referrals (31.8%), while 18.1% of surgery was performed in this group. Models of care involving orthogeriatric input, such as that seen in hip fracture care, will be required to best manage this vulnerable group. Increased funding for orthogeriatric care will be needed to ensure we improve outcomes, reduce length of stay and reduce mortality in this cohort. The trauma network model dictates that those who have suffered major trauma require transfer to a MTC. In certain situations, patients may be initially brought to a trauma unit where initial care is provided. It is essential that their care is not delayed. The transfer of patients to our unit continues to pose a problem as a result of bed availability. The advent of multi drug resistant organisms means infection control policies now dictate that the majority of patients require initial isolation. This occurs together with the failure of separation of trauma and elective surgery further limiting bed availability. These similar issues have been highlighted in other studies23,24. Clear transfer policies must be developed to ensure there is no delay in their treatment. If the current trauma system proposal is implemented pelvis and acetabular specialist services would be required to be present in both the central and south trauma networks. However, it must be noted that the proposed south trauma network currently receives less than 25% of PA referrals. This equates to approximately 55 referrals per annum of which just 21 referrals would require operative intervention. We support a single centre for the management of pelvis and acetabular fractures in the Republic of Ireland in order to maintain the resources and necessary skills of surgeons, nursing staff and other allied healthcare professionals in this specialist area. Based on our study pelvis and acetabular services should be located within the major trauma centre of the central trauma network. Improved funding together with greater orthogeriatric input and clear transfer policies are needed to ensure we continue to improve the quality of care we deliver. Our study is not without its limitations. It does not include every pelvis and acetabular fracture in Ireland but only those referred to our institution. However, as the national centre we expect to have captured nearly all fractures that warranted referral. While our database is prospectively maintained it is reliant on the quality of information received from other institutions. All data was extensively cross referenced from multiple sources to ensure it was as accurate as possible. The development of a trauma system in Ireland will improve the outcomes for those who suffer major trauma. The UK has shown that excellent results can be achieved in a very short time. It is important to remember that quality care saves lives. PA fractures make up one part of the Major trauma team and must be considered when implementing such a system. We hope this study will inform the development of such services. 11. Central Statistics Office (CSO) Ireland, 2016. Census of Population. Last accessed May 2018. 12. Rickman M, Young J, Trompeter A, Pearse R, Hamilton M. Managing acetabular fractures in the elderly with fixation and primary arthroplasty: aiming for early weightbearing. Clin Orthop Relat Res 2014; 472:3375-82. 15. National Institute for Health and Care Excellence (NICE). Fractures (complex): assessment and management. NG37. 2017. Last accessed Apr 2018. 18. Trauma towards 2014 – Review and future directions of the Victoria State Trauma system. Department of Human Sciences. 2009 Last accessed Sept 2018.